Yesterday, I gathered with my US history team for the second time this summer to work on our switch from a chronological to thematic course. We had decided on the structure of the year, so we set down to work on some of the nuts and bolts. We agreed that we want much of the work to be inquiry-driven, so we need to leave quite a bit of the planning open-ended for now. We started by talking about how we can create a living syllabus for our students, which will include assignments, class recaps, notes and links for each class period, to be updated daily – one stop shopping for students who miss class or need to review. We debated using Wikispaces or Google Docs and settled on Google since it it something we have been using already to some extent. We also decided we want students to create e-portfolios this year but tabled the precise planning for a future meeting. We decided then to spend some time looking for readings and resources that we might use for each theme – immigration, manifest destiny/foreign policy, economics and social classes, balance of power – and collect them on shared Google Docs. While we want to honor the interests and questions of the students, we also want to be able to point them to some quality sources. There will be times for them to find their own sources, but we also want to expose them to readings, sources, and sites that we know are useful. What we quickly realized is that resources are nearly all built on the chronological approach. We found ourselves picking out chapters and articles from sources. We had to look at the resources with a different eye, seeing what themes they might fit. All was going very well, until the Internet went down. The solution seemed simple – we retreated to the many print sources we had available to us, but since we were unable to update the Google Doc, we had to resort to making notes in the sources. Then, we started to talk, just talk, without one eye on the screen or the page. One colleague had the idea of having the students track their answers to the debatable questions throughout the year and reflect on them at the end. We decided that we would have students write their thoughts on index cards each time we came to an appropriate question, such as deciding whether the gilded age businessmen should be considered captains of industry or robber barons. Then, at the end of the year, each student will get his or her stack of note cards back to read through and reflect on their own values as reflected in their ideas. It is possible that they may disagree in May with what they wrote in October. We decided to go low tech with this, as we cannot be sure that students will have access to computers when we want to do the reflections. 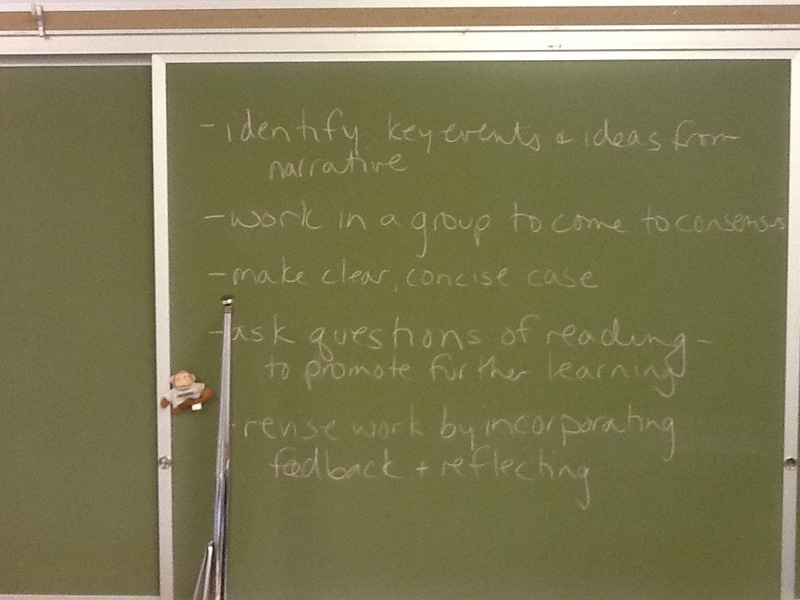 This led us to a discussion of grading – would we grade the reflections, if we did, what would we be looking for. 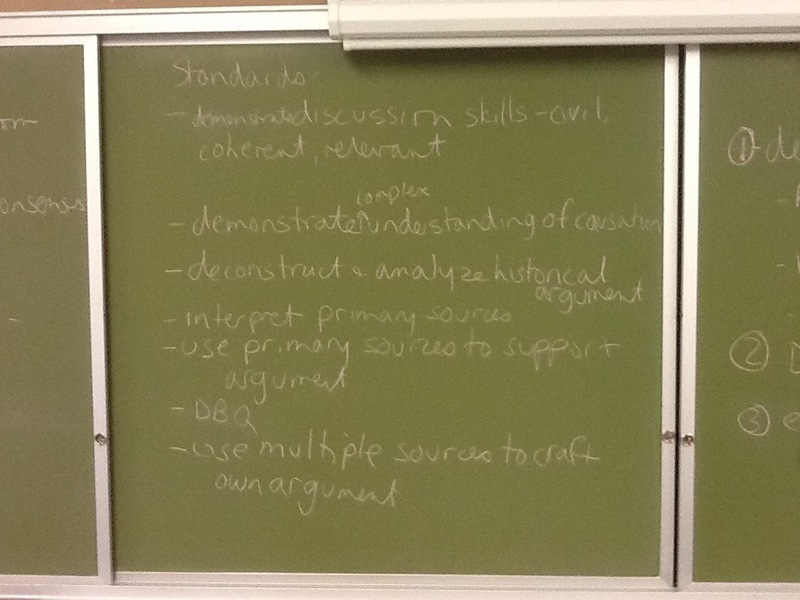 In short order we were listing standards we wanted our students to achieve in the course. I wrote them on the blackboard and took pictures with my iPad. In the last half hour of the day, we had gotten to the core of our work. The objectives we generated will ground us in our plans, our assessments, and our feedback to students and parents. I am attaching the images below. Please know that these are just our first draft. Thoughts and suggestions are welcomed, of course. In the end, we felt really good about where we were with the course. We have met during past summers to work on the course, but when it was chronological we spent a lot of time looking at the calendar, allotting days to topics and units, and hashing out what was essential for us to cover and what we could omit. In the end, these conversations were exhausting and dissatisfying. We left our meetings lamenting the lack of time. This year we spent our time thinking about what we want our students to be able to do and how we can help them get there. We have fewer plans, but we are more grounded. The content will be there. It was nice not having to decide whether we could afford to spend more than three classes on the Civil War and still get to the Sixties. For now, the planning is done. I will continue to write updates on our experience with the thematic approach through the school year. I just finished what is becoming an annual tradition, reading my blog posts from the previous school year to reflect on what I want to accomplish, where I fell short, and what I want to be mindful of as I begin the new school year. I highly recommend the practice. For reflective writing to have a long term effect, I think it needs to be revisited with the perspective of time. What I discovered was overwhelming to me. While I do not think I was like a broken record (showing my age with that analogy), the common thread was obvious. True student-centered learning is at the core of what I want in my classroom. I avoid things like Understanding by Design because I want my students to shape where they go. I want less planning and more agility in the curriculum. Students need to create for the wider world, and they need to call on others to help them. I have to encourage them to connect with me, with each other, and with people beyond our class. Precious little of value in this world is created in complete isolation. The classroom space should be comfortable and dynamic, a living learning environment, to facilitate this type of learning. All plans should be contingency plans, in case something better does not come along. Consider them to be Plan B. We are bound to miss so much, if we stick to our plans. I noticed this today, as summer vacation is winding down. I planned to spend this morning reading and working, while my children played at home, at the neighbor’s house or at the park. Those plans changed when one son decided to ride his bike,which he has not yet mastered, to the park. So, I went along, as did my neighbor (not her original plan either). It ended up being such a nice time; as we chatted, the kids played. My son has renewed interest in riding his bike. Then, after lunch we packed up to go to the pool. My other son had decided how long he wanted to stay. His plan was for us to be home by 4:00. While we were at the pool, he ended up meeting new friends and had so much fun playing with them. He abandoned his original plan. If we were not open to those changes, our day would not likely have been as good. I feel the same way in the classroom sometimes. I try to go with the flow when the class goes in a different direction than I anticipated, but I think I still try to force the plan too often. We have all been in classrooms and seminars where the teacher orchestrates the discussion and the activities to achieve a certain outcome. Many would argue that is just good teaching, but I am not sure it is great learning. I think it encourages students to simply play along or try to figure the teacher out without any real ownership of the learning. I can envision a classroom where my time does not go into planning because the students help to set the course of the class each day. While I do less planning than I used to, I am not ready to jettison my planning yet. Students are really not accustomed to being trusted to direct their learning, and I would have to think through multiple plans, as it is not likely everyone could agree. In fact, it might just favor the loud voices in the room. I would like to encourage more disruption of my plans, though, to more fruitful, meaningful outcomes for the students. So, for now I will keep on planning, but I will think of my plan as Plan B, the back-up plan. This will likely drive my colleagues crazy, as we work on collaborative teams, but it feels more true. We need to be sensitive to recognize opportunities whether they are part of our original plans or not. I am convinced the greatest experiences, large and small, are the result of some kind of serendipity. Start with stories. Novels, short stories, biographies, autobiographies. Of these I prefer novels and short stories. Historical events, concepts and themes matter when they connect to people. We value primary sources in history class, as we should, but we should not lose sight of the value of fiction. Primary sources matter in that they connect us to the past. Stories matter because they connect us to humanity. I have always thought this, but I have not worked hard enough to incorporate fiction into my history classes. This summer, a few different experiences have convinced me that I need to do more to lead with stories. Yesterday, I sat down to read International Migration: A Very Short Introduction, which is a book I am assigning for my International Immigration course this fall. Before I did that, I read The Arrival by Shaun Tan. A few days ago I finished Americanah by Chimamanda Ngozi Adichie. As I sat to read the book on international migration, which provides a great foundation touching on a lot of major themes, I kept thinking back and relating what I was reading to the fictional characters I had read about. Discussion of migrants becoming irregular by overstaying their visas made me think about Obinze in Americanah. The experience of being disoriented and the incredible motivation it takes to migrate took me to The Arrival. In fact, these are just two instances where the concepts I read about became real to me through the fictional characters. I connected easily to the concepts with images of specific characters in my head. Earlier in the summer I participated in a one-day seminar conducted by Leon and Amy Kass surrounding their new interdisciplinary curriculum, What So Proudly We Hail. Together with about twenty other teachers, we read short stories and discussed what they might have to offer us in the realm of civic education. While we focused on analyzing the stories, we could easily have used them as a jumping off point for studying history or current events. A Man without a Country put me in mind of the Edward Snowden case, for example. While I have not had the chance to look through the collection of stories to see what might provide students with those fictional touchstones, I plan to do that. The summer reading book we use for Modern World History is All Quiet on the Western Front. It really fits the end of the course, and sometimes we just leave it until then. This year, I am going to make a point to talk about it, about the characters, at the beginning, as well as when we get to World War I. Students get a much better sense of that war from the novel than they do from any other source I have ever used. It might make an even better transition into our Renaissance Project, where the students create their own characters and write their Renaissance lives, than a review of medieval Europe. A conversation about the role of fiction in studying history is a perfect way to begin. Start with the story. Our US history students read A Nation Rising by Kenneth C Davis. We are going to spend the first class discussing the stories in the book, the people and what happened to them. The historical questions and themes will emerge. We need to start with the stories.